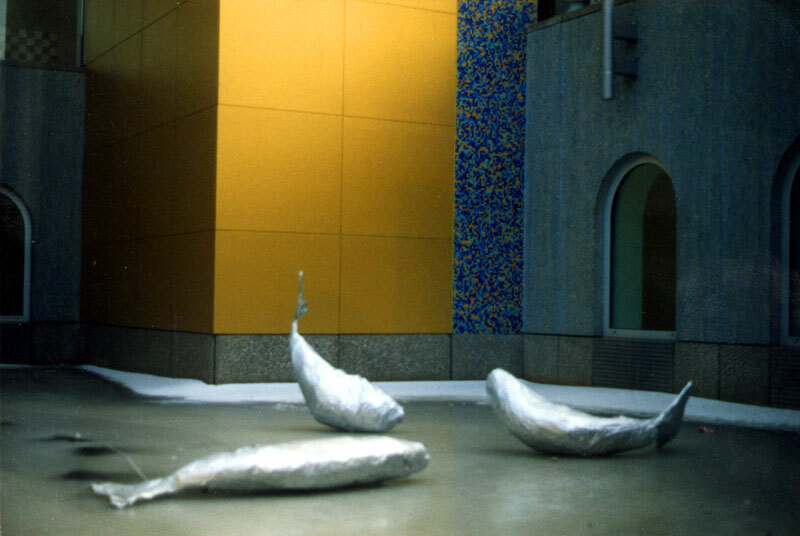 This work, erected on the frozen ponds of the Groninger Museum, was also the foundation of PIEK! Artgroup. In january 1996 Holland was harassed by very cold winter, and all the water was changed in a thick layer of ice. This was a good opportunity for PIEK! to organise a work on the ponds of the Groninger Museum. Three fishes were put on the ice, each one and half meter. There heads were turned to the museum, if they had the idea to swim right into the museum. PIEK! hung signs in the museum, just like the official museum signs. On those signs was the title of the work. The window frames of the building formed a frame around the work on the ice, and in a way it was a part of the collection. Over the ponds there is a bridge. On the rail PIEK! put signs with information about ‘the fish’, where it lived, etc etc. The information was shown like you see it in zoos.